Burner covers part 1 – paint it! Who’s ready to get crafty! I hope you will be inspired to create some of these same projects or spin offs! I LOVE to see what you have created from the ideas shared here in the Brassy Apple Flickr group! 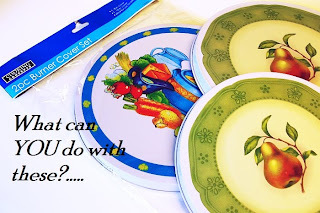 I have several tutorials to share with ideas all centered around using Burner covers! YUP – burner covers! In this day and age of flat top ranges and gas stoves these babies can be used in new ways! 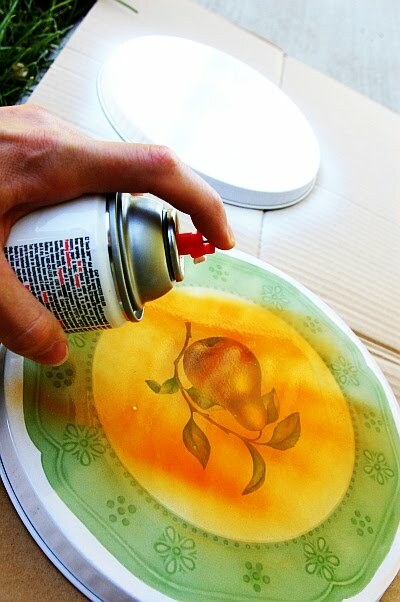 Cover the desired number of Burner covers with spray paint and let dry. 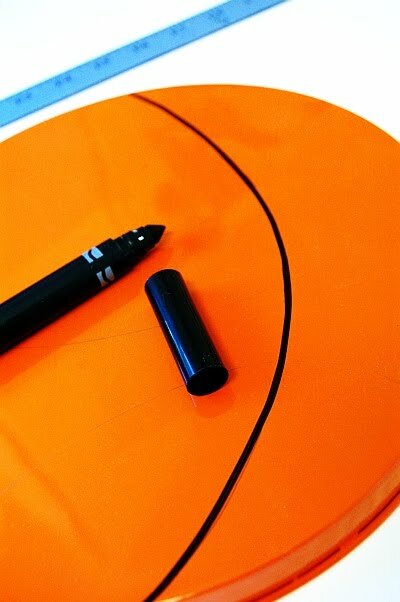 Add the details as necessary with a marker or paint pen or paint brush. Hang on your wall for a fun FUNCTIONAL art piece! 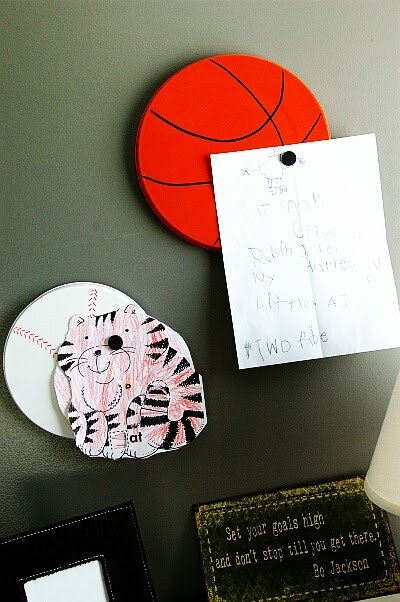 Left just as it they add color and interest but they can also serve as a magnet board to display pictures, school work, photos, etc….. I didn’t have time to try all ideas – that where you come in! Create some, snap a pic and share it! I will be linking up with some fabulous CRAFTY parties! Wow, I just love these. 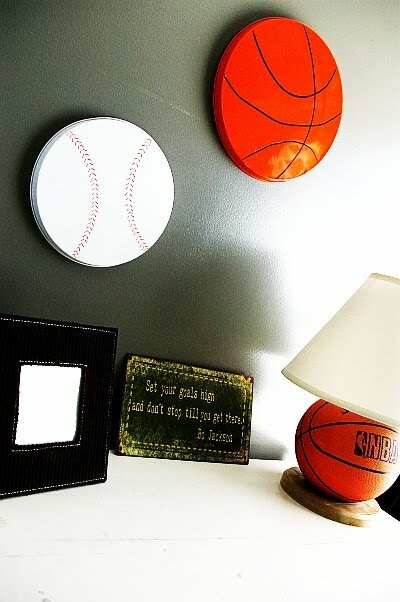 The sports theme is adorable for a little boys room and it is so great that they can double as an art work showoff spot. This is one of the best projects ever! Who would have thought one could transform those ugly burner covers into a cool & functional piece of art? Great job! That is a super cute idea! I wonder if I could transform them into some cute pieces for my twins’ room…hmmm…. Brilliant! What a great idea, I have got to try this, my son would love this. That is SO clever! 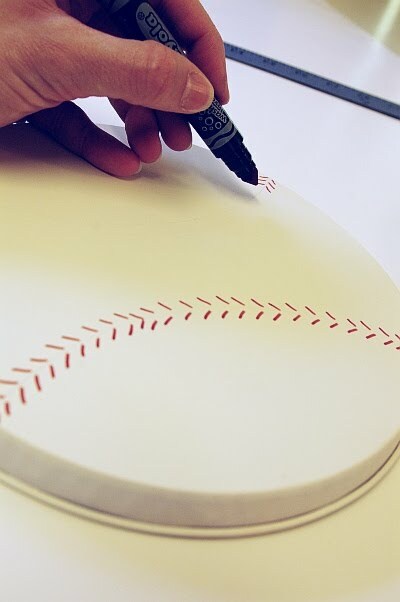 I could do a baseball for my sons room and just use them as colored polka dots for my girls room! Then they would both have magnet boards! I am going to feature your post tomorrow afternoon! That’s a great idea! I’m a new follower from the blog hop! Hope You can stop by and visit my blog. love this idea. How creative! 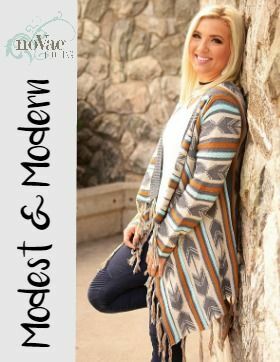 The Soul Mom is blog hopping on through from the WW blog hop. Following you and hope you’ll hop on by and follow me too! Wow what a great idea! I never would have thought! I love that they can be little magnet boards too!! What a seriously clever idea! I love that they are magnetic too. I can’t wait to see what other ideas come of this. cute – the wheels are spinning for what to do for my girls! you are a genius! I love this idea! Soooooo great. And how perfect that they are magnetic!!! Great tutorial. I’ll be on the lookout for these at the thrift store!! Such a NIFTY THRIFTY idea…luv it! Very clever. Love they are magnetic too. I have some laying around – now what color should I paint them? What a great idea!! I love it! I am thinking I might make soccer ball ones and give them to my little six yr old team I coach at the end of the season! Really cute! Great use as a magnetic board. Why do my kids have to be so old? This is awesome. I would love to do something like this in my classroom, but the walls are concrete. How did you mount the burner covers to the wall? Popping in from itsablogparty. I just picked some of these burners up! I haven’t decided on a design yet though. Thanks for sharing! This was one of my favorite links from last week’s Mad Skills party so I will be featuring it this morning. featured this awesome idea on my blog today! Hi MommaStair! thanks for the link! when I did this series I did a tiered tray too! 🙂 so fun to see the many variations! Hello There. I discovered your blog using msn. That is a really well written article. of your helpful info. Thanks for the post.